1. Ivory ruffle sleeve blouse, simplybe.co.uk - this blouse is so romantic and chic. I always thought Simply Be stocked exclusively plus sizes, but most items range from size 8/10 too! I came across this angelic top via Pinterest and was so excited to see it was going for £11.50. It's so dainty and pretty, they have some really dreamy pieces. 2. Sloth Mug, Amazon - the perfect mug for a chill Sunday, it's adorable! I love the speckled design and it features a little illustration of a sloth chilling out with ear phones on. I swear it is my spirit animal. 3. Sloth necklace, La Menagerie - this little cut out guy is irresistible too and made from stirling silver plated ultra durable stainless steel, plus 5% of all sales goes to World Wildlife Fund. 4. Statement frill sleeve cropped jacket, Simply Be - I really love this little blazer jacket/coat with the ruffle sleeves, it's so smart and chic and perfect to take between seasons. The perfect way to wear blush pink! 5. Pandora Piglet charm, The Jewel Hut - Pandora have a new range of Disney Winnie the Pooh charms and they are adorable! I am totally torn between this adorable Piglet charm and the enchanted teapot charm. 6. Checked Ruffled top, Simply Be - haha more from my internet browsing session! This top would be perfect for the colder months, I'd love to pair it with skater skirt and tights. I love the Victoriana look of the ribbon detailing on the chest and this top is only £13.50 at the moment. 7. GHD straighteners - this is definitely a splurge item. I have lusted after a pair of GHD's for so long and these limited edition gold by Lulu Guinness straighteners are gorgeous. They are a pearlescent pink and a limited edition kiss print design to celebrate the work done to support breast cancer research. They look incredible! 8. Beauty and the Beast coasters, Amazon - this coaster set is so perfect, I badly want it for our kitchen. The Mrs Potts and Chip design is so sweet, such pretty things for the home. I love the swirly slogans from the film. 9. Blush ruffle top, Simply Be - this top is slightly sheer and such a romantic garment, it's like modern day Marie Antoinette attire. I love the ruffles and 3/4 sleeves and right now it's only £11, a steal! 10. Punky pins Rose pin - I'm getting all the Beauty and the Beast vibes from this rose pin, it's so cute! I've been spotting and 'pinning' a lot of cute pins on Pinterest recently and found some really cute pin shops by some awesome fellow bloggers. I can't wait to collect more, there are hundreds of adorable designs. 11. Rose and co lip salve - my favourite staple balm is now available at Superdrug for £3.99. I've been stocking up after finishing my last tin, even though I have lots of lipbalm! It smells so beautiful and the packaging so pretty, it is multipurpose too so can be used anywhere. It's such a beautiful thing to keep in your handbag. That sloth necklace is possibly the greatest thing that I have ever seen! Ooo so many pretty things! Love the tops. 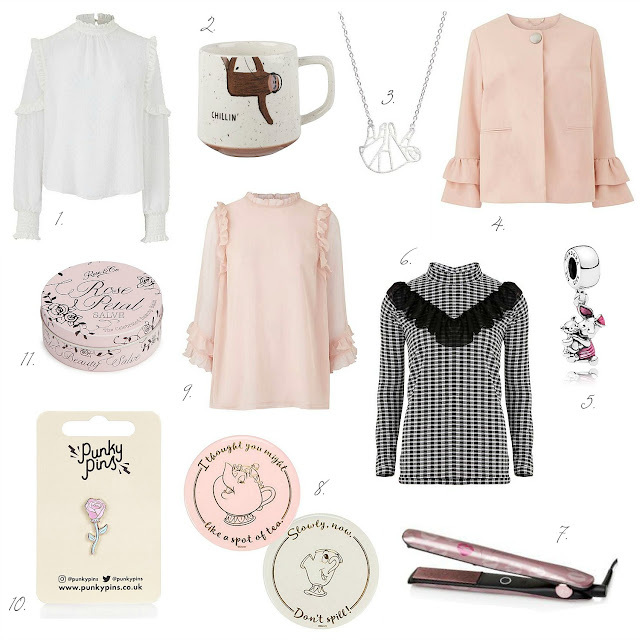 I love so many of these items, they are so cute! I swear you and I are so alike in our tastes - everything here has made me heart-eyed! I love the look of the blouse, and I didn't realise that SimplyBe did smaller sizes... Will definitely have to have a peak around their site one day. I love how all of your items that you've picked heavily contrast with the checked ruffle top, too, which just shows how much Autumn impacts our choices. At the moment I'm not too sure what's on my wishlist, but I'm definitely stuck in summertime mode still! I love Punky Pins, I have about ten! That salve sounds lush, I love rose scent/flavour.